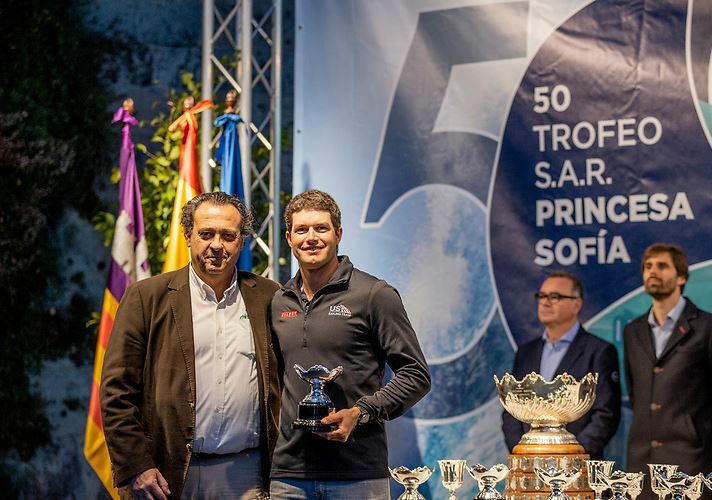 PD: A very successful regatta in Mallorca, What’s the feeling of taking Gold there and representing a beleaguered USA team that has struggled in recent years? CB:"Well for me, it was a great breakthrough moment for me, by far my best performance of my career. I’ve been knocking on the door for a while to get into that top group of the Laser fleet, and to come out on top last week was a surreal feeling." PD: Your Oly Bio page has you entering competition ranks in April 2009 at # 459 on the list, a year later you had dropped to 569 but then took a quantum leap and jumped into the 200’s later that year. What was behind that transition? PD: You broke in double digits in spring of 2013 then fell back a bit but in 2014 got back into double digits and have been progressively getting better and better rankings since. Where did the breakthrough come from? CB"I started sailing Lasers when I moved onto college sailing in 2009. 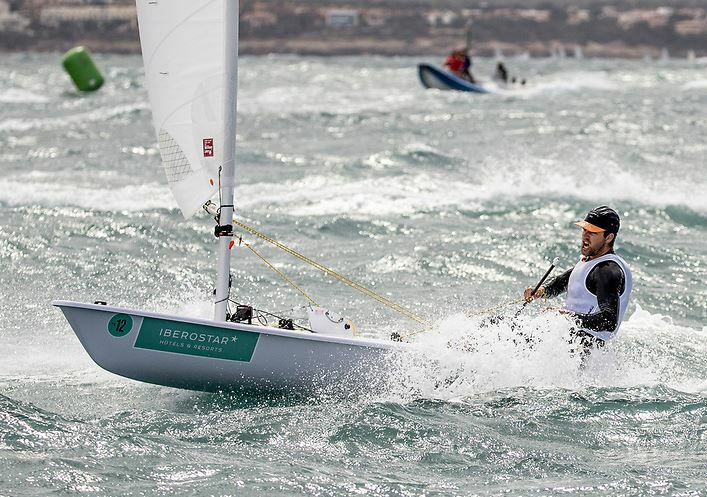 During the summer breaks and holidays, I would make time away from school to go do the occasional national and international laser championships to get as much experience as possible. The Laser world rankings are updated every few months and strongly based on recent results and how many events you recently competed in. My ranking during that period would largely vary during that time period as I was in school most of the year. 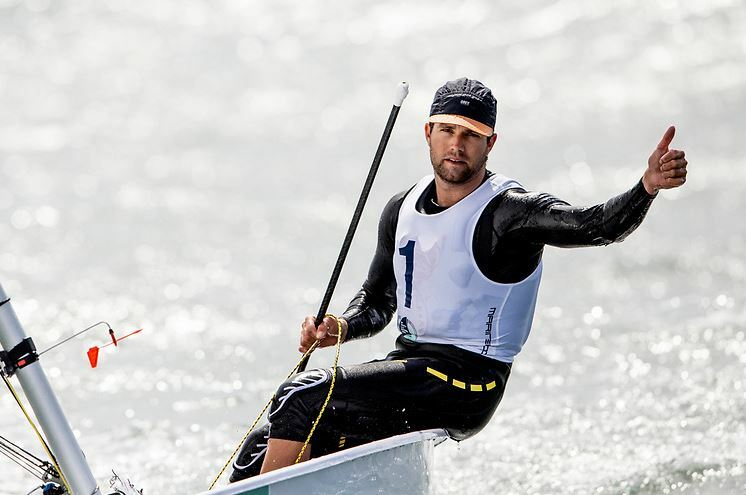 Following my graduation from Georgetown University and starting my Olympic campaign in the fall of 2013, my world rankings has steadily been climbing thanks to much more ample time in the boat, top end coaching, and more experience." PD: The Laser is a physically demanding boat, what is your current training schedule like? How many hours in the gym per week? On the boat per week? CB:"When we set out a program for the year, it often is set out in blocks, designating different focuses such as peak regattas, gym training, and sailing training camps. It’s not necessarily days on water per week, it’s more days on the water per year building around the peak event of the year such as the World Championships. Our goal is to get around 200+ days on the water. A typical training block we would schedule hard on the water 4 days on, one day off, 4 days on, and so on. During that camp, depending on how “heavy” the training on the water is, we will do gym sessions to compliment, as long as not compromising energy on the water. During the periods between regattas and training camps, important to designate how much gym work is appropriate to keep making gains or is it a period where recovery is necessary to prepare for the next event on the calendar." PD: You hail from Newport Harbor, where you learned to sail, and joined the NHHS sailing team where your team won 4 national championships, who were your teammates back in the day? CB:"Yes our team was very proud to be that successful winning all those championships. We had loads of talented sailors that went onto do more great things. I was fortunate to be teammates Charlie Buckingham, Michael Menninger, Chris Segerblom, Cole Hatton, Wade Hatton, Brooks Clark, Jeff Aschieris, Blair Belling, Nicole Grice, Brooke Thompson, Caitlin Beavers, Kayla McComb, Ryan Davidson, and Franchie Cappellini. Our coaches were Caleb Silsby, Zander Kirkland, and Payson Infelise." PD: You chose the Laser over other Olympic disciplines, and have stuck with it, ever tempted to switch? CB: "I’ve always had connection with the laser on a few levels. I like how it is singlehanded and I am solely responsible for the success and failure for what happens on the water. It has always been super fun to me downwind, having that connection to be able to play with the waves like a surfer. Finally, I’ve always believed it is the hardest class in the world to be successful in and all the best sailors in the world have come through the ranks of the Laser class, so the competitive side in me drives me to this fleet." PD: Your days at Georgetown where you were awarded the 2012 Collegiate sailor of the year, 3 Collegiate All American honors and a Team Coed National Championship, who were some of your team mates there and what set that program ahead of the pack? CB: "Georgetown was another successful program that I was a part of with loads College Sailors of the Year, All-Americans and championships throughout. I was fortunate to sail with top skippers Charlie Buckingham, Nevin Snow, Sydney Bolger, Evan Aras, Scott Furnary, Marco Teixidor, Pete Johns, Alex Post, and Sean Golden. Our top crews included Hilary Kenyon, Katia DaSilva, Alex Taylor, Caila Johnson, Ashley Phillips, Kate Canty, Tory Lynch, Leslie Cowen, Rebecca Evans and of course my ultimate dude crew Teddy Mark! Our coach Mike Callahan has been the leader for several years now and continues to be the bedrock of the program." PD: You earned a BS in Marketing at Georgetown, that can pay some large dividends in the professional and Olympic sailing business, how much has that assisted in your progression to date? CB:"Georgetown was a great education and loved the school. I decided on business school for many reasons, but I knew I wanted to do an Olympic campaign at some point, which is very much like running your own small business. Therefore I wanted to get at least some insight on how my education could help me there." PD: You are a prolific writer and your blog at http://chrisbarnardsailing.com is a well composed documentation of your sailing exploits since 2013. Most sailors don’t bother and many that do lose ambition soon and it drops off the table. How do you maintain you focus on that and in words, what would you express to other aspiring sailors the importance of sticking with that part of the journey? CB:"For me, the writing does two things. First, I have an array of donors and fans that support my campaign and it is important to them that they get a full insight on both the ups and downs of my sailing. They are just as much a part of this story and they deserve to hear about each step of the way. My followers have openly commented their appreciation on how candid I am about my self-analysis, so I try and keep to that brand. Secondly, the writing acts as a therapy for me to help get closure after each event, where I stand in my campaign, and where I am going." PD: You are now headed to Tokyo and have a great trajectory for the possibility of bringing home the bling in 2020. You have John Bertrand as your coach, the backing of the US Olympic team and ton of hard work in the rear-view mirror, but still a lot ahead. What’s your training competition plans between now and then? Is SF Bay /Treasure Island in the mix? CB:"John has come on board as coach as the end of last year and we are becoming a great team. This last week was an amazing breakthrough, but there is still a TON of work to be done. We are focused on the World Championships this July in Japan as they are part one of the Olympic trials, everything peaking towards that event. San Francisco is definitely part of our plans with the great conditions the venue provides and the support the US Sailing Team is getting for the new training base out of Treasure Island. " Last edited by Photoboy; 04-11-2019 at 12:37 PM. The Reineke girl in the radials cam in 3rd and Page Railey 6th, so there is hope on the ladies side too!